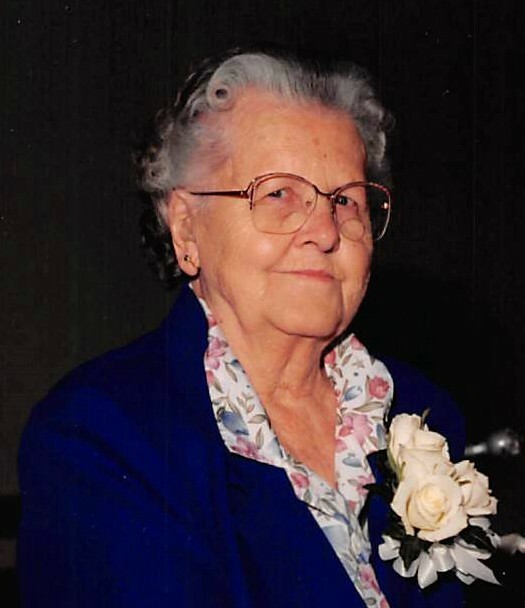 Margaret Alberta Smith Johnson, age 102, a resident of Heritage Health, Therapy and Senior Care in Mt. Sterling and formerly of Timewell, passed away at 3:08 p.m. on Sunday, August 26, 2018 at the nursing home. She was born May 4, 1916 in Perry, Illinois the daughter of Fred H. and Glenna Rust Smith. She married Oscar Leon “Doc” Johnson on December 16, 1936 in Pittsfield, Illinois and he preceded her in death on April 9, 1981. Alberta’s family moved to Timewell where she attended Timewell Grade school and graduated from Brown County High School with the class of 1934. She and Doc were members of the Timewell Christian Church and she was also a member of the Pea Ridge Home Extension for a number of years. Doc and Alberta raised their family on a farm north of Timewell. Following the death of her husband, Alberta moved to Timewell. In the spring/summer people passing her house enjoyed her flower garden. Alberta was an avid reader, receiving books from the library well into her 90’s. She also enjoyed gardening, crafts and started painting later in life. Her life was centered around her family. Survivors include three children Sandra A. Johnson Spenser of Madison, Alabama, Richard L. (Carmalee) Johnson of Timewell, Illinois and Roger L. (Karla) Johnson of Ft. Atkinson, Wisconsin. Five grandchildren Randall (Melissa) Johnson of Madison, Alabama, Craig Johnson of Mt. Sterling, Illinois, James (Sarah) Johnson of Chatham, Illinois, Mark (Tina) Johnson of Mt. Sterling, Illinois and Jerris (Tom) Cross of Avon, Indiana. Eleven great grandchildren also survive along with three nieces and two nephews and their families. She was preceded in death by her parents and two brothers Fred Jr. and Alvin Smith. Graveside services will be held at 11:30 a.m. Thursday, August 30, 2018 in the Mounds Cemetery near Timewell, Illinois with Rev. Steve Griffin officiating. Memorials are suggested to the Timewell Christian Church or the charity of the donor’s choice.